GoCD supports fan-in dependency resolution for pipelines that are on auto trigger. Fan-in material resolution will ensure that a pipeline triggers only when all its upstream pipelines have triggered off the same version of an ancestor pipeline or material. This will be the case when you have multiple components building in separate pipelines which all have the same ancestor and you want downstream pipelines to all use the same version of the artifact from the ancestor pipeline. Wasted builds : Premature runs which do not have the right version of dependent components because one of the dependent pipelines was faster than the rest. Incorrect feedback : Your deployment to Production should happen only when it has successfully passed the UAT, Staging and Pre-Prod environments but it was triggered prematurely as soon as UAT went green. Running code with the wrong tests : Your commit to SCM contains both code and tests written for the code. Your pipelines are modeled such that your acceptance or test pipeline runs after the build pipeline. Acceptance has to run with the right tests for the code but instead it triggers as soon as the commit goes through with the previous available version for tests. GoCD helps solve all of the above problems. For the next step, when deploying to production, we have a pipeline that depends on all 3 of the above pipeline so that a build that has succeeded in all 3 environments is automatically pushed to production. This is shown below. A new build is generated. The build is pushed to QA, UAT and performance pipelines. Regardless of the time taken in each of these pipelines, GoCD will ensure that production is triggered only after all three pipelines go green with the same version of build. 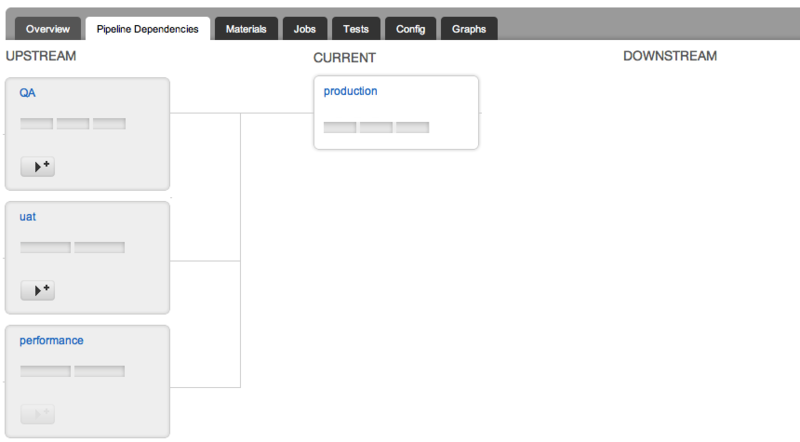 Production will use the right version of your build artifacts. Production should have trigger type as auto. QA, UAT and Performance should have Build as a material. Trigger type for these pipelines can be either manual or auto. The package pipeline should not trigger as soon as C2 is done. It should trigger only if both C2 and C3 go green. Additionally Package should use the same version of C1 that was used by C2 and C3. C1 is triggered on a change. C2 and C3 are triggered after C1 is successful. C2 builds quickly but C3 is still in Progress. Go resolves that C3 and C2 depend on a common ancestor C1. Hence GoCD will wait for C3 to finish. If C3 goes green, the Package pipeline will trigger. It will use the right versions of C1, C2 and C3. Add C2 and C3 as materials for pipeline Package. 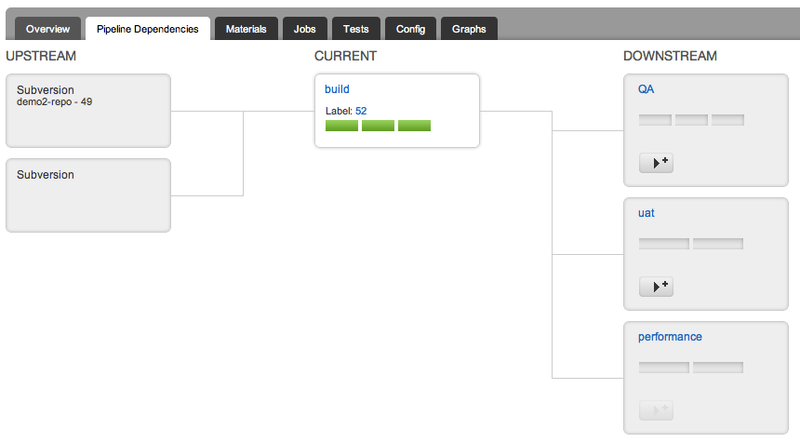 On committing the changes, the Build pipeline will trigger with the latest revision. Although Acceptance also has the same material dependency, GoCD will not trigger it immediately. Acceptance will now trigger with the same version of the SCM and fetch the right build artifact from the Build pipeline. Add the same SCM material to pipelines Build and Acceptance i.e the same URL. Pipelines Build and Acceptance have trigger type as auto. Fan-in and blacklist : If the pipelines contributing to the fan-in have blacklist in their material definitions, the target pipeline does not adhere to fan-in behavior. For example, refer to the scenario above. 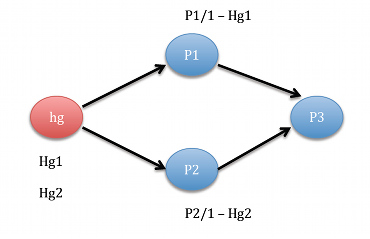 P1 and P2 are two pipelines which use the same mercurial (hg) repository, with two folders say “p1” and “p2”. P1 is configured with “p2” folder in the blacklist. Likewise P2 is configured with “p1” folder in the blacklist. The first run of P1 happens when a check-in happens in “p1” folder. The first run of P2 happens when there is a check-in to “p2”. In this scenario, P3, which is dependant on P1 and P2 does not trigger. GoCD will apply fan-in dependency resolution for pipelines that have auto trigger type only.